Home Is triple-glazing worth the extra cost? Is triple-glazing worth the extra cost? Gary Warby, Managing Director Premier Windows, discusses the benefits of triple-glazing over and above double-glazing and asks, is it worth it? Improving the thermal efficiency of their home is one of the main reasons that people buy new energy efficient windows and doors. They help maintain a comfortable temperature during all seasons while helping you save money. But with two measures of window performance, double and triple glazed options, A++ WER ratings and ultra-low U-values, how do I know what I’m actually getting and what offers best value for money? Triple-glazing is an issue that brings all of these things to a head. It costs more because it uses more glass. More glass means that material costs are higher but also handling and fitting costs because it’s heavier. So, do the advantages justify the extra money? First-up, you need to know a WER from a U-Value. A Window Energy Rating (WER) is a measure of window performance. It combines three different elements of window performance: Solar gain or how much heat the window allows into your home; and how much it lets out of it, either through draughts or thermal transfer and heat loss – the u-value. U-values are a measure of heat loss alone and do not account for the heat put into it through solar gain. This is a fundamental point. 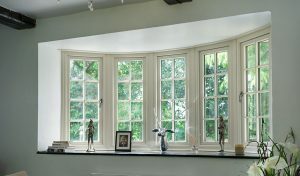 Triple glazing is better at reducing heat loss due to the extra glass. Conversely, while reducing heat loss that extra pane of glass, reduces the amount of sunlight that passes into your home, reducing solar gain. So in short – it’s a trade-off! Defining which is right for your home is a question of the individual characteristics of your property, for example aspect and not least budget! There has been massive innovation in glass. This includes the use of smart low-e coatings – a one-way door for trapping and holding energy – to the use of warm-edge spacer bars. These separate the sheets of glass in double and triple-glazed units to put ‘space’ between the cold air outside and warm air inside, insulating it in the process. This means that double or triple glazed units both deliver significantly improved performance over and above single or even older double-glazed units delivering savings of up to £200 per year dependent on specification of new energy efficient windows and doors [hyperlink as appropriate] and those being replaced. Triple-glazing essentially takes all of the innovations in double-glazing thermal efficiency and makes it better, this time by a ‘third’ or more, again. The trade-off is a corresponding reduction in solar gain. The triple glazed windows we supply are manufactured in a new purpose designed six chamber energy efficient system, which accommodates a 44mm triple-glazed unit, achieving a u-value as low as 0.8W/m².K. This also puts our energy efficient windows way ahead of building regulations, which currently state that all new windows must achieve a minimum u-value of 1.6W/m².K. Despite the claims of some window companies, an additional pane, won’t automatically reduce noise. Do I need triple-glazing for my property? As said, this is about your individual property and your budget. You need to consider all facts to make this decision, some houses may see the sun light a lot more than others which makes settling for double glazing much easier. But that doesn’t mean that triple-glazing is right for everyone or that double-glazing is by default not up to the job. We have an extensive range of high performing double-glazed windows and doors which achieve the highest standards of energy efficiency, just not quite as high as our triple-glazed range. The advantage is that double-glazed units will warm your home a little more through solar gain – not just keep the heat that you’re heating system generates in. Given the lower purchasing costs, payback times will also be shorter. For more information email enquiries@premwindowsanddoors.co.uk or call a member of our team for an informal chat on 0800 854 353.